in the mad scramble to appreciate them. Morchella the Mad Mushroom Queen dons rubber boots with running gear, straps on binoculars, grabs a mesh bag and is ready to go. You put them in mesh bags so their spores can sow the ground as you walk, swinging it. 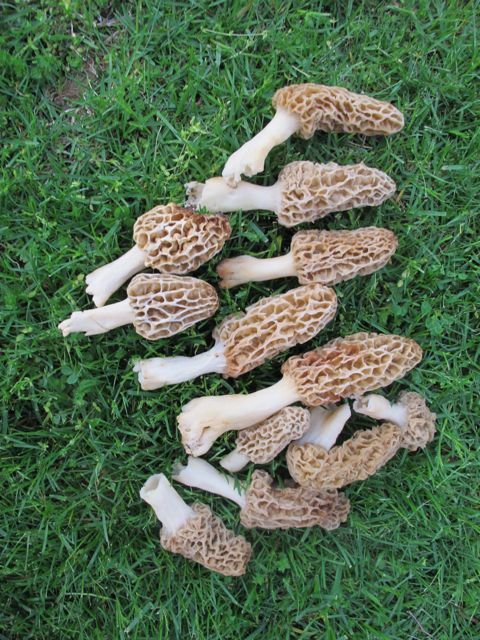 And then when you rinse them, you save the water and anoint new ground with countless millions of precious spores. This is how you thank them for feeding you. Such a fine meal they make. 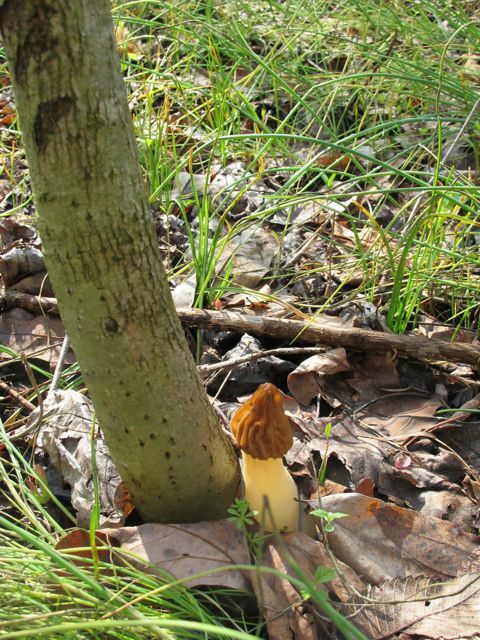 This is the white (or yellow) morel, Morchella esculenta. 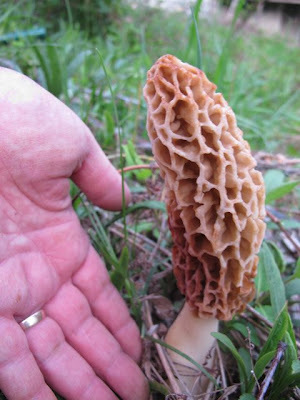 Our land also hosts black morels, Morchella elata, which are smaller and darker but just as delicious. 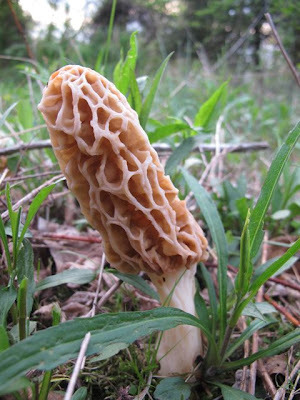 And then there is the half-free morel, Morchella semilibera, which is more common than either black or white morel on our land, and differs from them in having a pointed cap and a more diaphanous texture (it feels very hollow and flimsy). 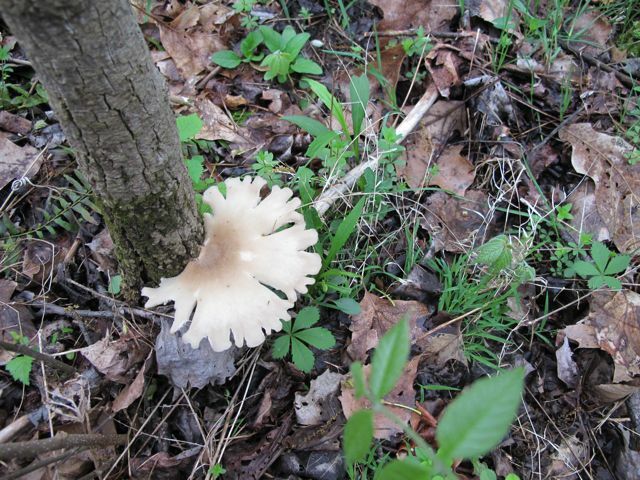 Upon being bisected, the half-free has its cap attached to the stem for only half its length. 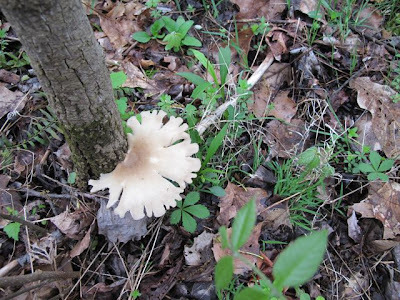 And the stem is hollow, and lacks any cottony fibers. 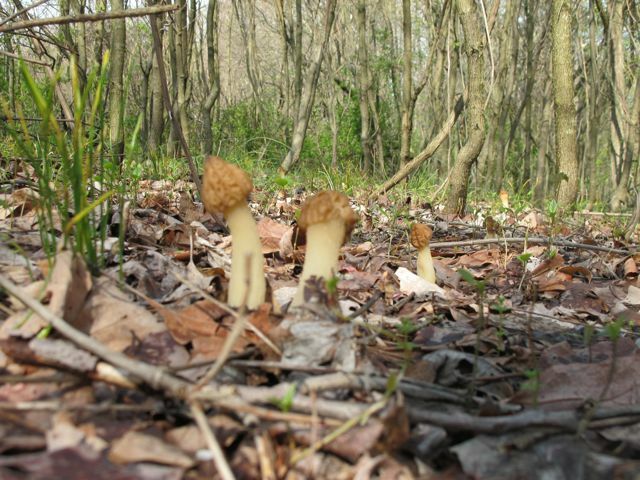 This is a very important distinction, to distinguish the edible half-free morel from the possibly poisonous false morel, Verpa bohemica. We have a number of nicknames for the half-free morel, none of them family-friendly. However, we are delighted to eat this one along with the white and black morels. They aren't as firm or solid, and get a little limp when cooked, but they still taste fabulous. You have to sautee them. Never eat any morel raw; one ignorant chef served raw morels to his patrons and made his whole restaurant very sick. We found more than 80 half-free morels in this spring's picking! 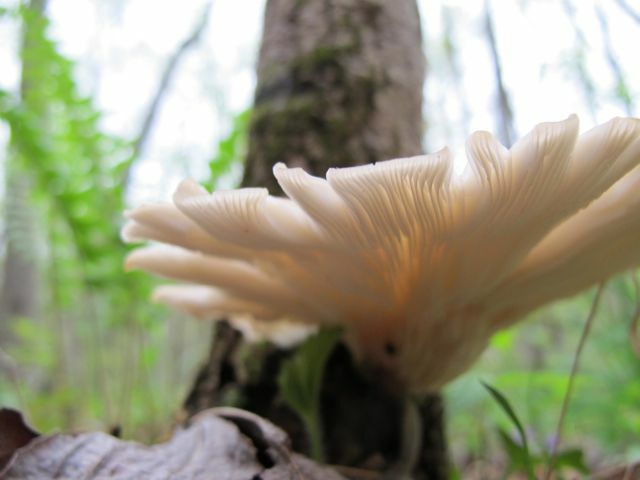 Plus a bonus oyster mushroom, Pleurotus ostreatus, beautifully scalloped. This is one of the bracket or shelf fungi that's wonderfully edible. And this was the prettiest one I'd ever found. Unlike the morel, oyster mushrooms grow on wood, living, dying, or dead. Here, I've found them on tulip, bigtooth aspen, and sugar maple. 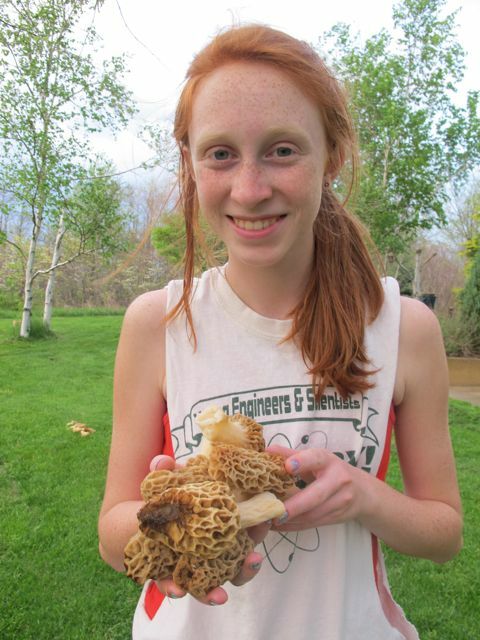 Phoebe and Liam LOVE hunting morels with us. If we see a few coming up, we always wait until the kids can join us to pick them. We just turn the kids loose and stand back. 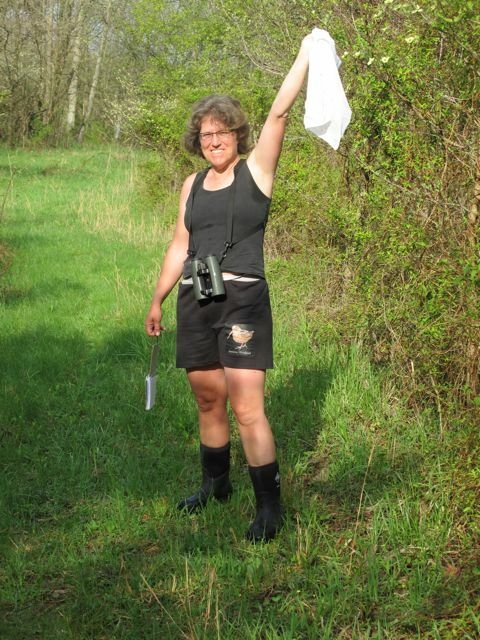 For whatever reason, we all hoot a lot while hunting morels. 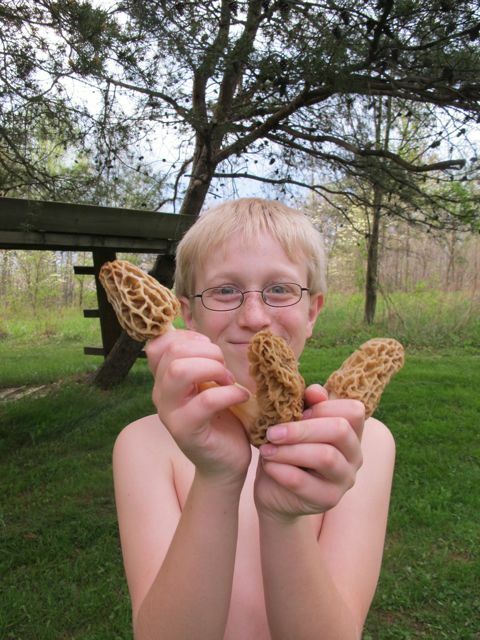 Liam was on his way to the shower when Bill found this mess o' morels. So he came out in the altogether to hunt. Yes, the best things in life are free. Wild women in black boots, naughty mushrooms ... what is this blog becoming? 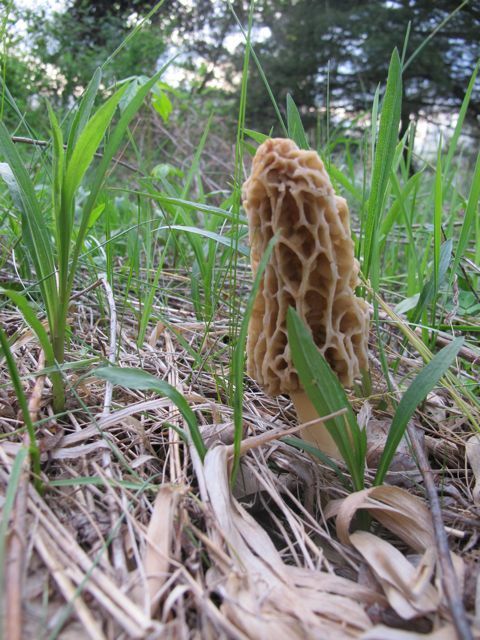 I have never seen a wild morel here, which makes me think they like cooler climes. I am envious. 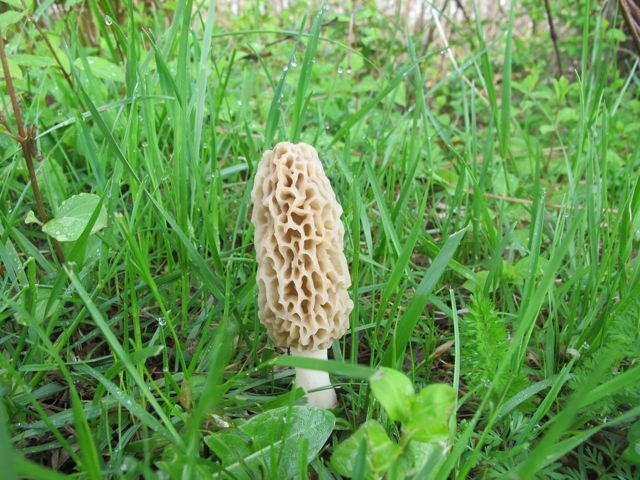 I avoid eating wild mushrooms down here, out of ignorance. I do recognize chantrelles which I believe are edible, but I just buy my fungi. I'm chuckling too because I also posted about a backyard harvest today, although sans booted beauties and fresh scrubbed elves. I hope the weather there is as near perfect as it is here this weekend. good for you! Looks like tasty fun. Season's got to be well past in TN--I'd think it would be early April there. But you can hunt next year! It shouldn't be hard to find information on where to hunt them in Tennessee. The Google is your friend. Ah, I remember Aunt Betty picking morels and cooking them for the campers at 'our' family holiday campsite on the Judith River in Montana.